I’ve always considered myself as a chameleon. I’ve moved from place to place, switching between juxtaposing positions easily, morphing myself into a vibrant, outgoing individual, to a more muted, conservative member of a group when needed. I am adamant about always improving, probably annoying all my friends and family with my incessant need to assess my current state of being and how I can improve. Am I overly critical? Like, on a scale to reasonable to ultra-high standards restaurant critic, where do I fall? Do I tell bad stories? How can I improve? Yes, I sound like a satisfaction survey. My close friends usually don’t say anything because they think I’m loopy and being weird, but I really do aspire to change and be better. I reflect on who I was as a high school student, then as a freshman in uni, then as a grad student, and I wonder if I’ve changed. It’s hard to look back and assess, because I’m naturally biased. I need a third opinion but nobody wants to be the bad guy and tell me I tell terrible stories and need to stop (I know they’re bad, I’m still working on it). I don’t see the change in me until I go back to those places. This week I’m working from Ottawa, visiting Chris and sitting in my old study spots and basically anywhere with WiFi and an outlet. I’m surrounded by versions of me from 4 years ago and it’s so weird to see. 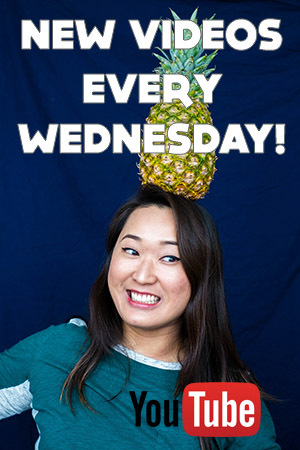 People who are still green and figuring out what they’re doing with their lives, finding out how to talk to boys (well, I haven’t figured that out really either but I haven’t had the need in about 6 years so that’s not a priority), navigating real life things like paying rent or doing your own car repairs. I was a gung-ho, ultra enthusiastic, high-energy, high impact kind of girl. I saw something that I wanted to do and then I did it. Even though I know I’ve changed so much in the past, I find that it’s harder to do that now. I’m less malleable to change. I find myself falling into patterns I know aren’t the best for me, but I still do it anyway. I speed just under the acceptable speed level. I probably could go faster or slower, but I refuse. I binge watch TV shows. I eat a whole bag of Sweet Chili Heat Doritos with a sleeve or Oreos even though I know that just because they’re vegan, they’re not good for me. I will avoid my yoga mat even though I know that if I just did 20 minutes of yoga, I would feel so much happier and better. It’s as if aspects of my personality are starting to calcify and I can’t break out of the position to change like I used to.Â Is this something that all people start to see as they grow older? Is the gradual increase of stubbornness to change, heartburn, and inability to sleep anything more or less than 7 hours a symptom of getting older? 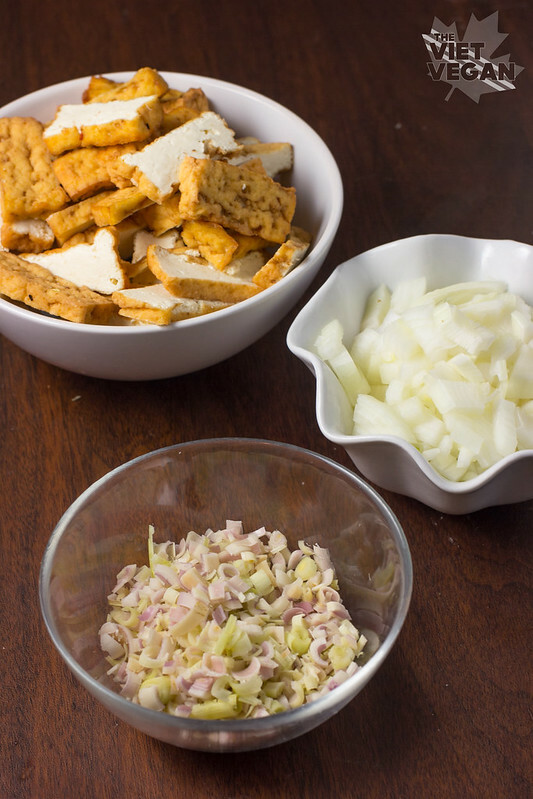 1 medium sized onion, diced OR 1 bunch of green onion, diced. Over medium heat, saute the onions in olive oil until translucent. Add garlic, chopped lemongrass and red chilli flakes, and stir until the lemongrass looks "melted". Add the tofu and soy sauce and stir fry, mixing well until the tofu has absorbed the flavour and is cooked through (about 5-10 minutes). Serve over rice, rice noodles, or even in rice wraps! *I used fresh for this recipe because honestly it looks nicer, but frozen tofu will yield a different texture that's a bit more spongey from the freezing process. The water in the tofu will create pockets that are great for absorbing flavour. My mom always makes this with frozen tofu and frankly I think it's tastier, but both fresh and frozen taste good. I've never heard of kanom jean. What is it? 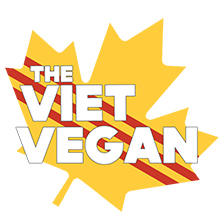 Hi Lisa, love your blog and LOVE Vietnamese food. It's so fresh and healthy! I'm half Thai, living in the Netherlands ( next to Germany) . Khanom Jean is a noodle salad with white Japanse noodles and a fresh coconut dressing with normally ginger, pineapple , chili and dried shrimp in it. I love it. The tofu looks great. I will defenitely try it ! Yeah my mom actually cooks with the woody bits too but they just get stuck in my teeth and I have to chew them a lot and it feels like I'm literally eating grass or something. Not pleasant, and I'd rather avoid it if possible haha. Just made this for my 10 yr old. Big smiles as he wolfed it down. He wants it every week. Thankyou! Aw I love hearing that. Thanks Jenny! Hey, we're practically neighbours! I love your blog and LOVED this recipe:) I googled "fast and healthy lemongrass tofu stirfry" and was not disappointed. Great flavour, fast and simple enough that my 4 year old could 'help' me make it, and all our young kids loved it! I will make this again and definitely share it. Thanks for posting! Hi Lisa, when you use frozen tofu do you defrost it first? Hi Christina,Yes! Defrost it first =) My mom sometimes defrosts it in a bowl of warm water, I've defrosted it in the fridge overnight before. I can torally relate to always im proving but trying best to remain unbiased! Just went vegan 2 months ago. Started meditatig twice a day. Constantly changing. Constsntly adapting. Constantly tweaking and refining. Finding that middle ground. Have fun on your journey. Found your article after ordering lemon grass tofu at a vietnamese restaurant at my home in O'ahu Hawai'i. Thanks for the blog, totally relatable. Hi Celyne! I'm not sure. I don't live in Ottawa anymore, the places I would have gone would be any Asian grocery store in Chinatown, but I'm not sure if they have any in Orleans. have you found it? Loblaws and Farm boy (those two are where I grocery shop the most) carry it. It's delicious. Hi Lisa,Can you add other veggies to this? OR have you you tried that? Such as bell pepper, onion etc.Thanks! You do you! This recipe already has onion in it but add whatever ya want, you're the Goku of your lemongrass tofu. Thank you so much for the lemongrass tofu recipe. I made it last night and my husband and I devoured it all. I was looking for a recipe that was close to the lemongrass tofu I used to order all the time at Chateau Saigon in Atlanta. This recipe met our expectations. I can't wait to make it again. We had no leftovers, but I wish we did! Hi Alana,Tofu is pretty prevalent in Viet culture, at least it was for where my family is from (Saigon). If they still don't think tofu is traditional, you could go about the angle of supporting more Buddhist or catering to more people: Since more and more people are going vegetarian/vegan these days, and even if an entire family isn't vegan, they will often pick a place that has vegan options if one member family is. This looks delicious. Will this recipe yield crispy tofu or so I need to bake it first? Thank you! 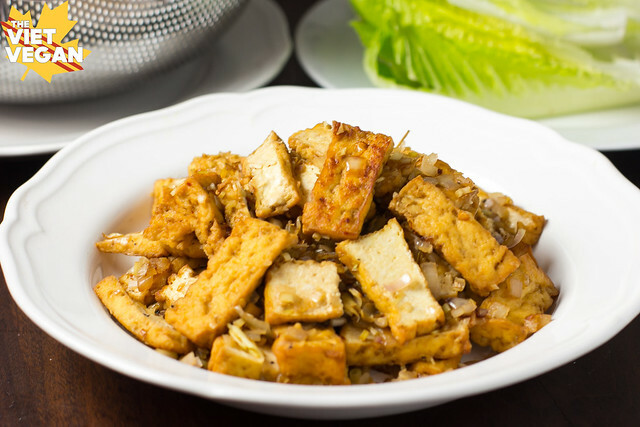 I love Tofu with Lemongrass and Chilies, and this looks like a great one to try. I'll probably make it spicier. I like it hot! 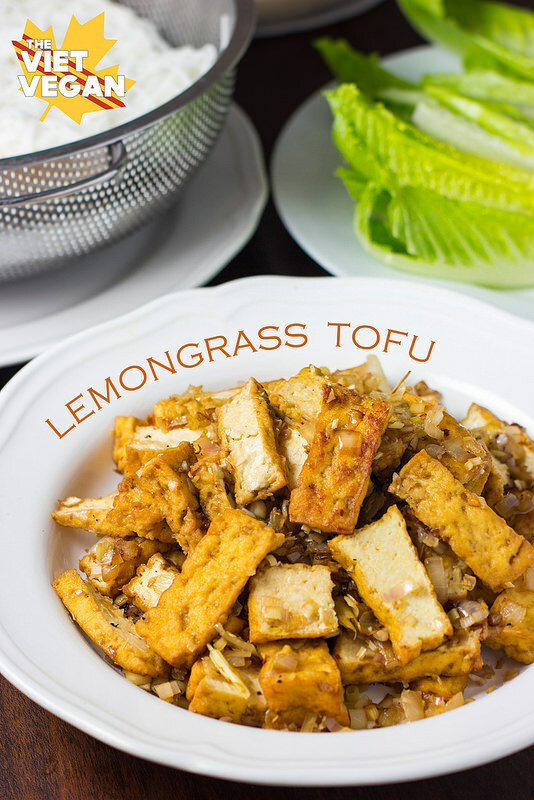 Hey, I have a question: every time I make this, the lemongrass/onions/spices burn terribly after the first batch of tofu.. How do I make sure that doesn't happen? Is that because of my pan, or do I reduce the heat? I'm so confused.. Oh and another one, do you just fish out the tofu with chopsticks and clean the lemongrass bits off, or do you serve it all together? Thanks! Also, my (viet) dad told me to marinate the tofu in soy sauce and lemongrass overnight and it was a great idea! Love. Hi Anami! Yes marinating would definitely make the flavour much bolder! You serve it with the lemongrass, the idea is that once it's processed, the bits are quite small and easier to eat. If you're finding that they burn quickly you may need to reduce the heat OR cook for less time. Thank you so much, Lisa!! You're awesome. Just tried this for the first time, and it’s delicious! I used lemongrass paste from a tube and also garlic paste, just to save time. We all loved it! The only thing I would change for next time is to go easy on the pepper flakes...just a sprinkle would do it for the kids, I think. Thanks for the great recipe! Going into rotation.